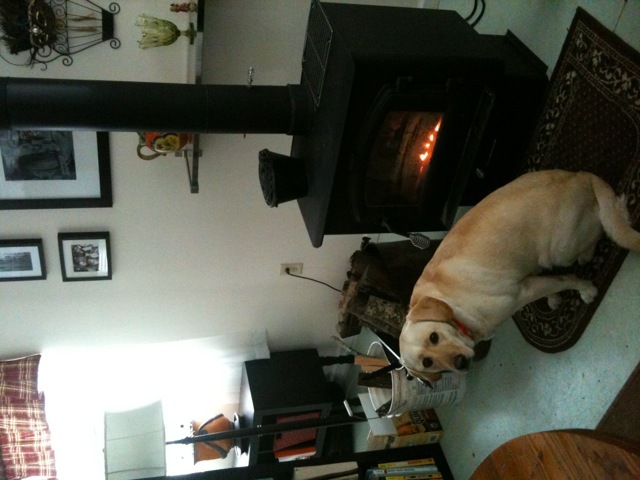 The heat of a wood stove is the best heat ever, but there is a down side to having one. The ash floats in the air and covers everything. I believe the biggest culprit of the Mount St. Helen ash clouds is the action of scooping out the ashes from the stove. Every morning I scoop ashes from the stove and diligently try to keep the dust eruptions to a minimum. I have found that using a spray bottle to spray the ash while its on your shovel and keeping it held in the stove reduces some puffs from emerging. Then I very carefully crack the lid of the ash can and slide the shovel of ashes inside. It’s not a perfect solution but seems to help. Hot dog by the fire. Using a damp rag to dust furniture works well too. A Swiffer duster wouldn’t be able to keep up. I like to use a piece of flannel cut from some old PJ’s. Having a broom and dust pan handy is another must. Carrying wood into the house drags in dirt and pieces of bark and twigs always fall onto the floor. If your not living off grid and can keep a hand vacuum plugged in it works better than a broom. There are inconveniences to having a wood stove, but most of it is just my time keeping things tidy and also Sonny’s hard work cutting wood in the fall. On the bright side we stay toasty warm and don’t have to pay those high fuel or electric bills. Ahh, it’s nice and warm in here.